Ever since Microsoft previewed the Windows Phone 7 Mango update back in May, we’ve been eager to get our hands on the next generation of smartphones running Microsoft’s OS. The new phones are slated to arrive this fall, and September has brought some leaks, rumors, and actual confirmed phones. In fact, last week at the IFA tradeshow in Berlin, HTC unveiled the Titan and the Radar, the first of its Mango phones. Windows Phone 7 sales have been slower than anticipated over the past year. According to IDC, Windows Phone 7 will account for just 3.8 percent of the market by the end of this year. Despite its clean user interface, Windows Phone 7 failed to win over customers due to the lackluster phones that run it, the absence of some essential features (such as multitasking of third-party apps), and a dearth of compelling apps. So why am I excited about the Mango update and the next generation of WP7 phones? Mango includes more than 500 new features designed to improve multitasking (yes! ), offer more-dynamic information, and make apps and the operating system work together more efficiently. Plus, manufacturers seem to be stepping up the power and attractiveness of their soon-to-launch phones. HTC's Titan and Radar on display at the CTIA conference. HTC, LG, and Samsung will most likely be responsible for the first Mango phones that reach U.S. shores. We should start seeing U.S. versions of these next-generation WP7 phones unveiled at the CTIA conference in mid-October. The leaked--and confirmed--phones I’ve seen look pretty exciting. True to its name, the HTC Titan rocks an absurdly large 4.7-inch super LCD display (compared to the 3.7-inch iPhone 4 or the 4.3-inch HTC EVO 3D) with a resolution of 480 by 800 pixels. Powered by a 1.5GHz processor, it supplies 16GB of storage, 512MB of RAM, and an 8-megpaixel camera. The Radar has a 1GHz processor with 8GB of internal memory and 512MB of RAM. It also carries a super LCD screen that has the same resolution as the Titam's but measures 3.8 inches diagonally. LG has a penchant for teaming up with fashion houses for limited-edition phones, and rumor has it that WP7 Mango will get some of that haute couture love. A Jil Sander-branded Mango phone is thought to be a dressed-up version of the LG Optimus 7, which came out last November. Another rumored phone from LG is dubbed the Fantasy. Leaked images of this model show it as having a larger-than-average display. One Samsung-made device has already put in an appearance, but its name, specs, and date of availability remain unconfirmed. At Microsoft’s Worldwide Partner Conference, the company showed off a Samsung phone rumored to be the SGH-i937, which supposedly is the WP7 version of its Galaxy S II phones. Other partners include Acer, ZTE, and (of course) the long-awaited Nokia phones. Nokia partnered with Microsoft to launch Windows Phone 7 smartphones back in February. Unfortunately, none of the rumored WP7 phones will connect to a 4G network. When I met with Microsoft in June, its product managers told me that though they were interested in 4G technology, all models in this next generation of phones will be 3G. The Bing search engine makeover is definitely my favorite enhancement in Mango. One example is Local Scout, which uses GPS to recognize where you are and then provides you with hyperlocal search results based on your preferences. If you want to find a restaurant, Local Scout will list restaurants in the Eat+Drink guide that lie within a 25-mile radius of your current location. Another cool and useful feature in Bing is Music search. Hold your phone up to a speaker, and Bing will identify the track that's playing and give you information about the artist, the song, and where to buy it--sort of like Shazam on iOS and Android. 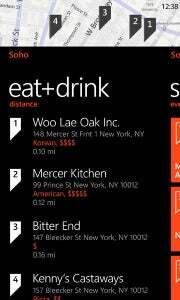 Visual search resembles Google Goggles somewhat, except that it's built into the Windows Phone platform. Say you're in a bookstore, you see a book, and you want to know more about it. If you point your phone's camera at the book's cover, Bing will only search for reviews, prices, and more information about the book. I may be in the minority here, but I’ve always been a fan of the Zune music software (the Zune player is a different story). The Zune software on the phone and its features in the PC client are gorgeous, user-friendly, and a refreshing alternative to iTunes. The Music+Video Hub, where the Zune player lives in WP7, now has Last.fm, Slacker, and YouTube integration, so you can easily see a list of the videos you've watched or the songs you listened to on those services. There's even a playlist creator in the Zune Player called Smart DJ (Microsoft’s way too similarly named variation on iTunes’ Genius Playlist) that creates mixes based on similar songs in your collection. This has been a feature of the Zune desktop software for quite some time--and it's a welcome addition to Windows Phone 7. If you’re an Xbox addict, you'll appreciate Windows Phone 7's Games Hub. The Mango update includes features previously found in the separate Xbox Live Extras app, including improved Xbox Live messaging, integrated achievements, and the ability to edit your Xbox Live profile. Oh yeah--and your 3D avatar is now fully animated. It’s the little things that make gaming on Windows Phone 7 such a treat! One strength of the original Windows Phone 7 OS was its Microsoft Office integration. Currently in Windows Phone 7, users have access to OneNote, Microsoft’s version of Evernote, which lets you jot down notes and associate images with them. Also in WP7, you can view, edit, and create documents in Word and Excel. With Mango, Windows Phone 7 owners will be able to save and share Office documents through Office 365 and Windows Live SkyDrive, assuring them of access to the latest documents when and where they want them. You'll be able to write a document on your PC, save it to SkyDrive, and open it later on your phone. This is a boon for business people who need access to their Office documents wherever they go. In Mango, you'll be able to pin an email folder--for a project, say, or from a specific group or person--to your start screen for quick access. You can also pin an RSS feed from Outlook. Email messages are organized by conversation, so replies to a thread will be consolidated into a single view that you can follow easily. If you use Outlook for work, Windows Phone 7 makes accessing your email on the road that much easier. One characteristic that Microsoft hopes will differentiate Windows Phone 7 from iOS and Android is its approach to apps. A new feature called App Connect will tie apps to search results in Bing. Apps on other platforms don't interact with other aspects of your phone, Microsoft argues. App Connect will incorporate the information from each of your apps--whether it be a music app or a weather app--seamlessly into Search. So if you're searching for a movie, for example, App Connect will integrate ticket-purchasing information from the Fandango app along with your standard search results for movie times, reviews, trailers, and similar data. Since Mango isn't out in the wild yet, developers haven't integrated these capabilities into existing apps yet. When I tested Mango in July, I tried to search for local movie times to see whether information from Fandango or IMDb apps would show up, but it didn't work yet. App development is crucial to the WP7 platform. A severely limited number of apps won't help WP7 gain traction in the market. As of August 27, 2011, the Windows Phone 7 Marketplace had more than 30,000 apps available. That’s a lot of apps, but the number seems measly when compared to the Android Market’s 250,000 and the iPhone App Store’s 425,000. Many developers I’ve spoken to over the past year have said that are reluctant to develop for Windows Phone 7 because of its slow growth in sales. Will the Mango update and these next-generation Windows Phones change that? We shall see, but I remain optimistic.